The inability of the Bill and Melinda Gates Foundation, other philanthrocapitalist foundations, and governmental aid organizations to feed people on the African continent is clearly outlined in Who will feed Africans? 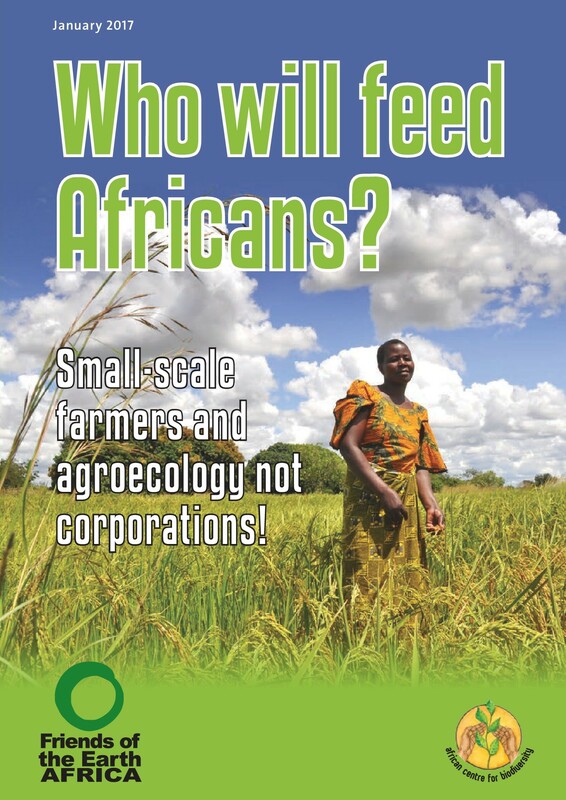 Small Scale Farmers and Agroecolgy Not Corporations!, a new publication by Friends of the Earth Africa and African Centre for Biodiversity. The report details two opposing visions of African agriculture. On the one side is the externally-driven strategy of the Gates Foundation’s intervention in African agriculture through programs like the Alliance for a Green Revolution in Africa (AGRA). This pushes out African farmers in favor of agribusiness corporations that focus on genetic engineering, cash crops, and chemical fertilizers. The alternative vision illustrates the successes of agroecology – agricultural science based on local ecosystems and local knowledge – on the continent and the ability of agroecology to feed people, preserve ecosystems, and resist climate change. Furthermore, the report outlines policy reforms needed to promote agroecology and ensure food sovereignty. Who Will Feed Africans? describes three pillars of the new Green Revolution: 1) Infrastructure in agricultural growth corridors; 2) Policies and institutions that promote and protect privatization and violate intellectual property rights; 3) Technical and practical support. These pillars promote legal and policy frameworks designed to protect private investment and corporations at the expense of small scale farmers. The new Green Revolution relies on “improved” inputs that are intended to ultimately contribute to the sale of surpluses. The idea is that farmers should pay for inputs such as hybrid seed and synthetic fertilizer with the goal of increasing output. Selling the surplus is meant to provide extra income for future purchases of inputs, as well as provide additional household income. This system is problematic because inputs have been highly subsidized through Farm Input Subsidy Programmes (FISPs), which makes farmers dependent upon subsidies to purchase those inputs. Additionally this system provides a consistent market for multinational seed and fertilizer companies through government programs. AGRA Watch notes the central role played by the Gates Foundation in the funding networks pushing genetically-modified (GM) crops and industrial agriculture in Africa. 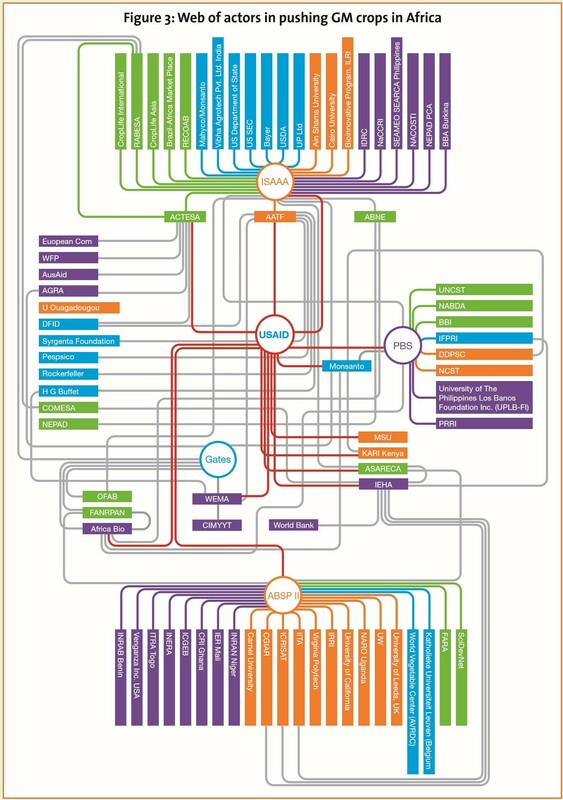 The figure below provides a visual representation of their involvement. Farming techniques that use high inputs of GM seeds and chemical fertilizers threaten the biodiversity and indigenous seed varieties crucial to food security while also displacing farmers from their land. In addition, such techniques make farmers and their communities less resilient to climate change, while increasing reliance on corporations and governmental subsidies for their livelihoods. 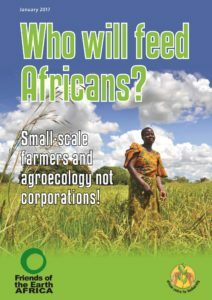 The report offers a more appropriate vision of African agriculture that promotes food sovereignty, sustainability, and social justice, arguing that small-scale farmers are integral to feeding the African population. The fact that “small-scale farmers produce 80% of food consumed in Africa, on less than 15% of available land” reflects the need to support small scale farmers and agroecological farming practices. Who will Feed Africans? argues that a policy revolution is needed to turn this vision into reality. It outlines three processes to achieve this revolution. First, “it is necessary to unblock ideological barriers, particularly the entrenched beliefs that large monoculture and industrially managed systems are more productive than diversified, small-sized agricultural systems (despite contrary evidence), and that synthetic chemical inputs are indispensable.” Second, governments need to invest in agroecological knowledge by promoting the augmentation of agroecology practices through farmer skill transfers, agriculture extension, and integrating traditional and local knowledge. Lastly, policy needs to create environments to allow “scaling up and scaling out” of agroecology. CAGJ and AGRA Watch share this vision of the future of agriculture, and work to unblock the ideological barriers inhibiting agroecology and food sovereignty.